Francisco Pizarro was born in Trujillo, Estremadura, Spain in about 1471 and died in Lima Peru on June 26, 1541. He was the illegitimate son of Gonzalo Pizarro, an infantry captain, and Francisca Gonzalez. Francisco never went to school, and never learned to read or write. He sailed to the New World with Alonzo de Ojeda, on November 10, 1509 and was with him on his discoveries of present day Venezuela and Colombia. When Ojeda founded the city of San Sebastian, in Colombia, Pizarro, was left in charge of the settlement while Ojeda went to Española for supplies and re-enforcements. Due to sickness, lack of food and supplies, and hostile natives, the colony soon started leaving, and Pizarro went to Cartagena. At Cartagena, he joined the expedition of Martin Fernández de Encíso, who had left Española with supplies for the colony of San Sebastian. This was the same expedition, that Vasco Nuñez de Balboa had stowed away on. From Cartagena, the fleet sailed on to San Sebastian. While there, they had problems with the hostility of the local inhabitants, and Balboa suggested that they move across the bay, to a place where the natives did not have poison arrows, and were friendlier. They then settled the town of Santa Maria de la Antigua del Darien. When Balboa took command of the community, Pizarro followed him. Pizarro was one of the officers in Balboa's battles and conquest of the different native caciques in the region, and also accompanied him on his expedition across the isthmus and the discovery of the Mar del Sur. In 1515, Pizarro was sent with several other expeditions to collect gold and treasures from the natives in Veraguas and along the Pacific coast. When Pedrarias move the capital to Panama, he went along, and was in many battle with all of the warlike tribes in Veraguas. 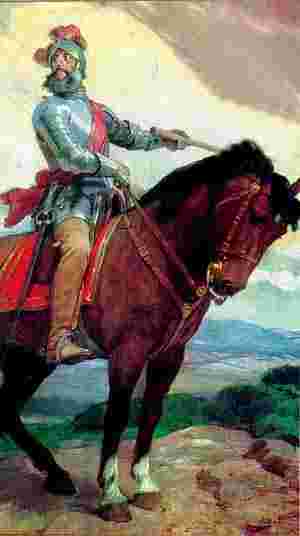 In 1520, he accompanied Espinosa when he went to do battle with Urraca, the Cacique of the natives in Veraguas and the colony of Natá. By 1522, the success of Hernando Cortéz in Mexico, and the stories of the cities of gold in the south, made Pizarro want to head an expedition to the south. He formed a partnership with Hernando de Luque (a priest), Diego de Almagro, and Gaspar de Espinoza (the man with the money). to explore to the south of Panama. They called their enterprise, the "Empresa del Levante". The rights to the exploration of those lands was controlled by Pascual de Andagoya, and they had to purchase those rights. Almagro was a conquistador who was looking for adventure, and just happened to be in Panama at the time. Luque was a Spanish Cleric, who was familiar with civil law and political intrigue. They were able to get the support of Pedrarias after giving him a share of the profits, if any of the expedition. 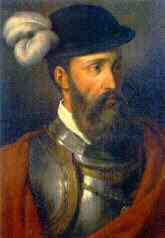 As soon as the money needed to finance the expedition was raised, Pizarro assumed the job of the expedition leader. Almagro had the responsibility of getting all of the equipment and provision and Luque, was to remain in Panama, and look after the expeditions interest, and make sure that Pedrarias did not turn against them. Pizarro set sail in November, 1524 with 114 men, and 4 horses. Almagro was to follow with another ship, as soon as it was ready. The first trip, did not yield any great quantities of gold. Pizarro only went as far south as Punta Quemada, off the coast of Colombia. He sent back some of the small quantity of gold he was able to get, to Pedrarias, to keep him happy, and in support of the expedition. Almagro, having set sail after Pizarro, got as far as Rio de San Juan in Colombia. Not finding Pizarro, he to turns back and meets him in Chicamá, where Pizarro had gone. Part of an illustration showing the meeting in Panama of Pizarro, Almagro and Luque, forming their company for the exploration of the lands to the south of Panama. The partners purchase 2 ships and Pizarro and Almagro set sail to the San Juan River, where Almagro had been to, on the last trip. Luque was again to remain in Panama, looking after their interests. At the San Juan River, the party separated, with Pizarro going to the mainland to explorer and search for gold. Almagro was to return to Panama to get more re-enforcements, and supplies. In Panama, Luque was able to recruit the services of another ship, commanded by Bartolomé Ruiz de Estrada. He sailed as far south, as to the equator, and collect a lot of stories of the riches to be had, further south. They returned to pick up Pizarro and give him the good news. They found him and his men in poor shape, exhausted and disillusioned. When Almagro arrived from Panama, with more re-enforcements and supplies, they all started sailing south, until the reached Tacamez, the southern part of Colombia. Here, the decide that Almagro should return to Panama for more supplies and men, while Pizarro continues on to the Island of del Gallo, to wait for the return of Almagro. 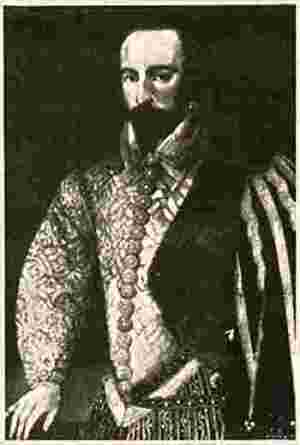 When Almagro arrived in Panama, with the request for more men, and the news of how bad the things were going, the new governor of Panama, sends two ships to the where Pizarro was at, ordering them to return to Panama, and that the expedition was off, and did not have the backing of the governor, any more. 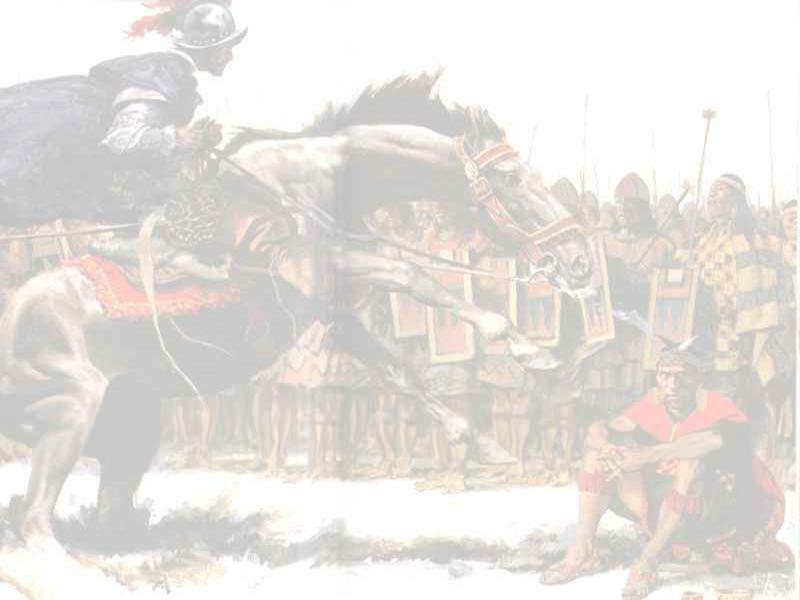 Pizarro refused to go back, and was left behind with only thirteen volunteers. Fearful of the natives at Gallo, they built a raft and sailed to Gorgona, on the Columbian coast. In the mean time, Almagro and Luque were able to convince the governor that all was not as bad as it seemed. He then consented and allowed them to equip another expedition with sufficient men and supplies. They also had the explicit orders that Pizarro was to return in six months to Panama. When the ship arrived at Gorgona, it lacked the re-enforcements that Pizarro had hoped for. Pizarro set sail, anyway, down the coast as far as present day Ecuador and to the northern part of present day Peru. He founded the city of Trujillo of the coast of Peru. Pizarro had given strict orders that his men were to be friendly to the natives, and not do anything that would make them hostile. Because of this, he had the good fortune that all of the natives he encountered were friendly. After being gone for 18 months, Pizarro returned to Panama. Even though he had glowing reports of the area, and a large quantity of gold, the governor did not think that the risk warranted further exploration. At the insistence of his partners, Pizarro went to Spain, to plea their case to King Charles V. After putting his proposed expedition before the King, and convincing him of its merits, a charter was signed on June 26, 1529. 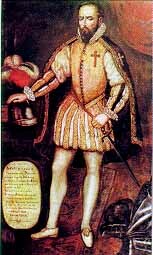 This charter, granted Pizarro the Order of the Knight St. James, the title of Adelantado, Governor and Captain General and absolute authority in all territories he might discover and subjugate. A new government, independent of Panama, was granted to him in perpetuity, that extended 600 miles south of the Santiago River, the boundary between Colombia and Ecuador. He was given the authority to elect all officers who would serve under him, to administer justice, and Alguacil of these new lands. With 250 soldiers, his brothers Hernando, Juan, and Gonzalo, he set sail from Spain on January 18, 1530. Arriving in Panama, his first job was to smooth the ruffled feathers of his two partners, who were given very little recognition in Pizarro's charter. Early in January, 1531, Pizarro sailed from Panama on 3 ships, 180 men and 27 cavaliers. Almagro and Luque were to remain in Panama, gathering more re-enforcements and supplies. He landed at the mouth of the Santiago River, and set out to explore the land. He sent back 3 boats to Panama, for more men. During their explorations, they reached the Gulf of Guayaquil, and were attacked by hostile natives. At that time, 2 ships arrived from Panama, with 100 men and some horses, commanded be Hernando de Soto. With re-enforcements, Pizarro pushed on such that on November 15, 1532, they entered the city off Coxamaraca. Invited Atahuallpa to meet with him, and captured him. The ransom paid by the Incas to release their ruler, Atahuallpa, was filling a room that measured 22 by 17 feet with gold. This amounted to 15,000,000 pesos of gold, which the Incas did, but Atahuallpa was not released. He was executed on June 24, 1534. After the gold was split between all the men in the expedition, the leaders, and 1/5 share for the King, each man go about $52,000. When new of Pizarro's conquest reached Spain, the King was so overjoyed, that he conferred the title of Marques on Pizarro. He extended the land over which he was to governed another 140 miles to the south. The title of Adelantado and Governor of Chile was given to Almagro. Luque was not granted any titles, since he had died some time before. Almagro, immediately set out to conquer Chile, with a force of volunteers.